Join Gold Record, Grammy nominated artist Dave Rudolf to celebrate the release of his new album ‘British Reinvasion,’ his 35th album which includes songs of the Beatles, the Who, the Rolling Stones and more. Joining Dave will be keyboardist extraordinaire, John Chorney, on bass the extremely talented Ryan Rudolf and guitarist Marc Adrian. The concert will take place on Friday, February 10 at 7:30 p.m. at Edgar’s Place Coffee House which is located at the Unitarian Universalist Community Church, 70 Sycamore Drive in Park Forest. This concert is sure to be a total blast! 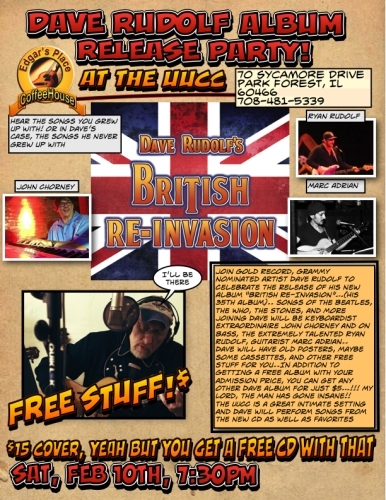 Dave and friends are going to play songs from his latest British Invasion CD, as well as other Dave favorites we know and love and maybe some you haven’t heard yet. 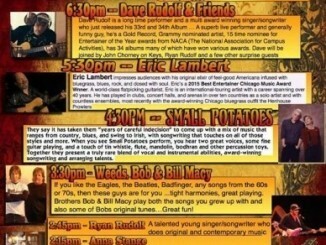 And, some bonus goodies: you will get the free Dave Rudolf CD of your choice with the price of admission. There will be a lot to choose from. Plus, any additional CDs you want to buy are only $5 each. There will also be a swap table where you can bring any “white elephants” to trade. We’re asking that you try to keep your items in the ’60s or ’70s theme. They don’t have to actually be from that time period, (but that would be extra groovy). They can also represent that era. Records, posters, buttons, lava lamps, love beads, etc. You get the picture. Finally, you’ll get to experience a fresh new act that Dave is going to have as his guest musicians at this show, Ashley and Simpson. They are Jen Ashley and Joel Simpson, and they are delightful. 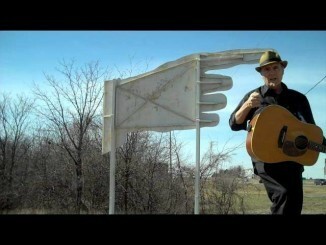 Lots of reasons to not miss this show! Tickets are $15 at the door (cash only) and don’t forget the ticket not only gets you admission to the concert but a free CD too. What a deal!